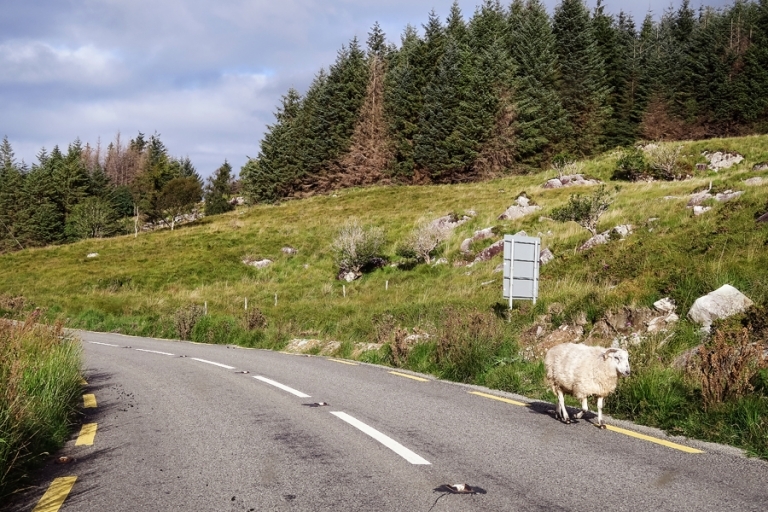 Since I was pretty much in charge of the whole Ireland itinerary (Chris had more input for the Scotland plans), I arrived in County Kerry without knowing if we would drive the Ring of Kerry or take one of the roads less traveled and see the Beara peninsula or the Dingle peninsula. With Killarney being a good starting point for any of the options, I figured we’d make a game-time decision. 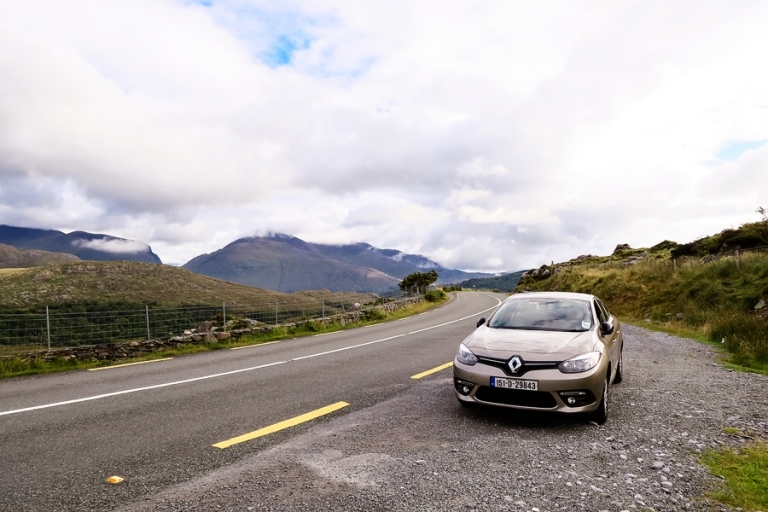 After talking with our B&B host, he highly recommended the Ring of Kerry as the classic must-see route, so we took his advice and added a twist – we tacked on the Skellig Ring (which I’ll cover in another post). I actually didn’t do much planning around this part of our trip since I didn’t know what we would end up choosing and I didn’t want to get my hopes up in case the weather wasn’t cooperative, but we were incredibly lucky with a gorgeous partly sunny/mostly cloudy day and no rain! We had received some additional advice from a couple we met in Dublin who insisted that we absolutely should not drive the Ring of Kerry because we’ll miss the sights, but we decided to go with our guts and pass on their suggestion to take a tour bus in favor of DIY flexibility. In hindsight, we are so glad we drove the route ourselves, but I realize it might not be for everyone. If you are scared of heights, feel uncomfortable with cars squeezing by you on very narrow roads, or if you simply prefer to sit back and watch the scenery from the window, then I would recommend the tour bus route. I’m sure it has other benefits, too, like meeting new people and sticking to a specific schedule. I need the flexibility to get out of the car at photos ops though, and Chris has the left-hand-side driving down pat, so we loved taking our comfy rental car around the ring for Day 2 of our road trip. We left before 9am on a Monday morning and followed the common advice to drive clockwise in order to avoid trailing the tour buses. 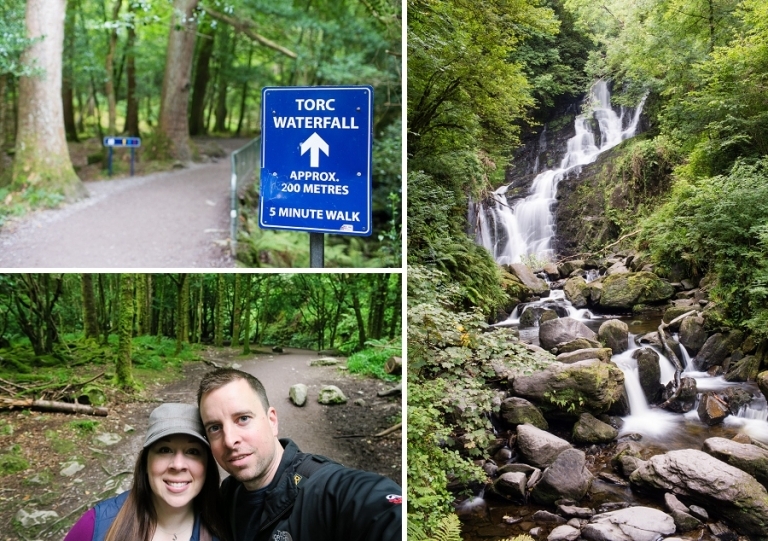 At our first stop, Torc Waterfall, we had the trail and the waterfall all to ourselves with not a single other soul in sight. 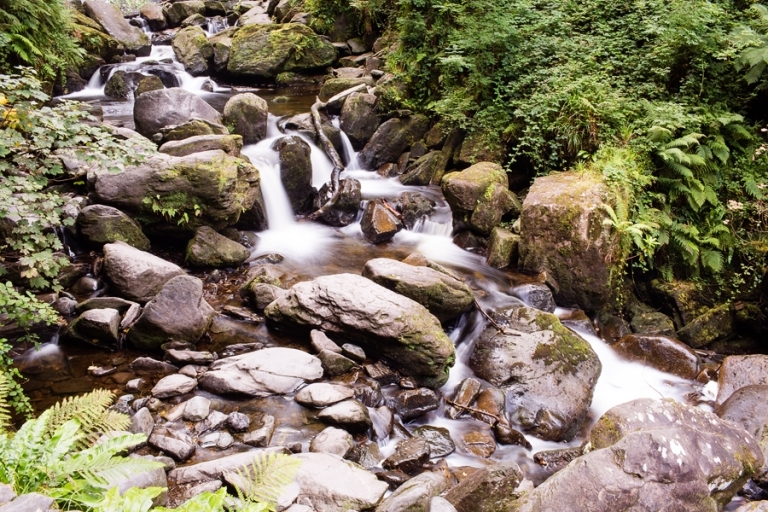 We listened to the stream and the various forest sounds of Killarney National Park in peace, and we didn’t have to feel guilty for setting up a big tripod for a few long exposures of the waterfall. 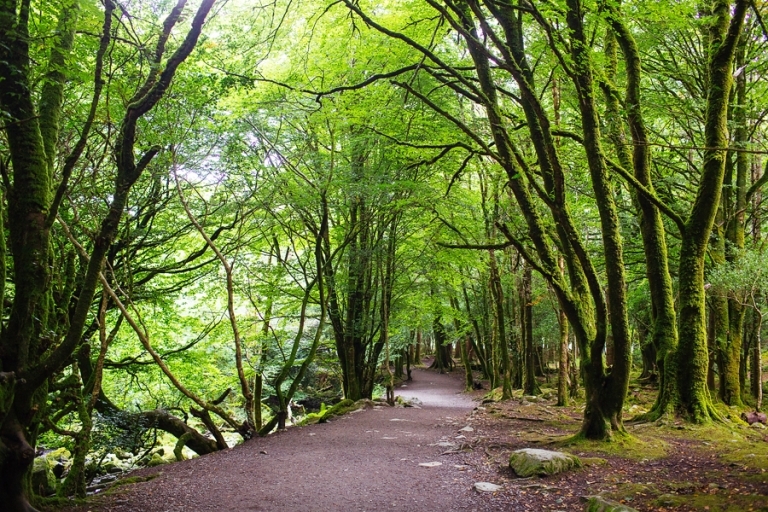 It was the perfect start to our Ring of Kerry adventure. I attribute the peaceful solitude to our early morning start. We ended up having most of the popular spots to ourselves. Certain classic Ring of Kerry stops like Ladies View were perfect for quiet, reflective moments. A midge did bite me on the forehead while I was taking this photo, but otherwise…very peaceful. The adorable town of Kenmare is a great spot to stop for breakfast (or lunch if you got a later start), or even just to do some shopping and walking around. We ate an Irish breakfast at a little cafe, and I also finally ended up buying a European hairdryer to use on this trip and future trips since the tiny hotel dryers usually don’t quite cut it. Back on the ring, we found plenty of random nooks and crannies along the road to stop and explore. I’m pretty sure the tour buses don’t stop at every little gorgeous spot – most of the time there was only room for about two or three cars to park. If you drive the ring, I recommend pulling over almost any time you see a spot to park the car! Derrynane Beach, another suggestion from our fantastic host at the B&B, turned out to be one of my favorite stops on the Ring of Kerry. To find it, we followed directions to Derrynane House, parked in the parking lot, and followed signs to the expansive sandy beach. Temperatures and currents made the beach unswimmable while we visited, but the scenery alone was worth the detour. I don’t think we could have gone wrong with any of the west coast peninsula options, but I’m glad we went with the classic Ring of Kerry. Because I didn’t do any pre-planning, I was a little worried and I wasn’t sure if it would be obvious what exactly we were supposed to see along the ring. But rest assured, you can show up for this road trip without a specific plan and still see the main sites that are well-marked with signs, plus an amazing sample of mountains, beaches, lakes, ruins, and the greenest landscapes imaginable. Our self-guided tour of the Ring of Kerry ended up taking the full day, and it was one of my favorite days of the trip! Next up: the Skellig Ring, a small detour off of the Ring of Kerry that deserves a post all on its own. Susan - Denise, I loved seeing your photos of Ireland! And I totally get what you mean about that place stealing your heart. It certainly took a bit of mine, too!